Welcome to the Virgin Islands National Park Information Page. The Virgin Islands are about 40 miles east of Puerto Rico and lie between the Caribbean Sea and the Atlantic Ocean. Virgin Islands National Park is located on the Island of Saint John. There are basically two options for arriving at Virgin Islands National Park, commercial airlines or via cruise ship. If you travel via the airlines, you will land on the island of Saint Thomas and then have to take a ferry to Saint John’s. The park is accessed via North Shore or Centerline Roads. Hourly ferry service from Red Hook, St. Thomas (a 20-minute ride) is available to St. John and operates from 6:30 am, then on the hour from 7:00 am – midnight. Ferry service from St. John to St. Thomas runs on the hour from 6:00 am – 11:00 pm. Less frequent ferries travel between Charlotte Amalie, St. Thomas and St. John (a 45-minute ride). Most popular Park areas are easily accessed by local taxis, called safari buses. Rental vehicles are available in Cruz Bay and are necessary to travel to some of the more remote areas on St. John. Parking is limited at many Park sites. Reef Bay and Cinnamon Bay Trails and Salt Pond can be accessed by public bus service running from Cruz Bay to the Coral Bay area by way of Centerline Road (Route 10). Check the most current schedule posted near the Cruz Bay ferry dock. Boats are necessary to visit some Park bays lacking road access. Bicycling is not recommended within the Park, due to very steep, narrow and winding roads. US citizens don’t need a passport, but at departure everyone needs proof of identity, either a voter registration card, birth certificate or passport. On 02 August 1956, legislation was passed by Congress to authorize the establishment of the Virgin Islands National Park. This act limited the potential acreage of the Park to 9,485 acres on St John (an island 12,500 acres) and 15 acres on St Thomas. On 05 Oct 1962, the boundary of the Virgin Islands National Park was expanded to include 5,650 acres of offshore areas (waters and submerged lands). These acres are considered to contained some of the most significant natural features within the Park. They include coral reefs, mangrove shorelines and sea grass beds. The Park boundary was again expanded in 1978 to include Hassel Island located in St Thomas harbor together with “…adjoining lands, submerged lands and waters” to equal the 12,908.60 acreage, with water area being 5,650 acres. In 1976, the Virgin Islands National Park became part of the biosphere reserve network designated by the United Nations. The goals of the Biosphere Reserve Project are to “establish a network of representative ecosystems, conserve genetic diversity, monitor changes, develop techniques to restore the land, and study traditional use and conduct experimental research”. 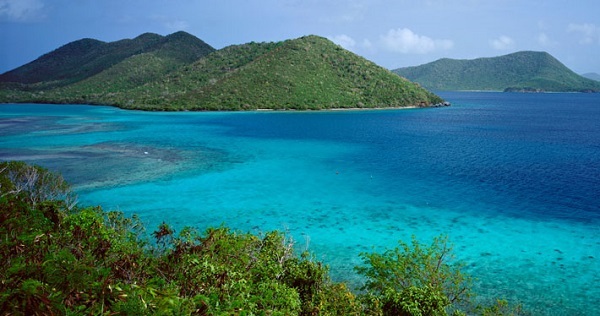 The Virgin Islands National Park is the only biosphere in the Lesser Antilles. The park covers more than one half of Saint John Island and Hassel Island in Saint Thomas harbor and includes quiet coves, blue green waters, and white sandy beaches fringed by lush green hills. Virgin Islands National Park is open year round with highest visitation Dec through Apr, and lowest May through Nov. The nearly five centuries of the Virgin Islands’ cultural history is as colorful and enthralling as a carnival parade. Humans inhabited the area long before Columbus arrived. Archeological discoveries show that Indians migrating northward in canoes from South America, lived on St John as early as 710 BC. They hunted and gathered foods primarily from the sea. Like most of its Caribbean neighbors, the island later ( c. AD 100) supported a small population of Taino Indians who chose sheltered bays for villages, made pottery, and practiced agriculture. Columbus may have named the islands, but no lasting settlements were in place until the 1720’s. Attracted by the lucrative prospects of cultivating sugar cane, the Danes took formal possession in 1694 and raised Danish colors in 1718, thereby establishing the first permanent European settlement on St John at Estate Carolina in Coral Bay. Rapid expansion followed, and by 1733 virtually all of St John was taken up by 109 cane and cotton plantations. As the plantation economy grew, so did the demand for slaves. Many who were captured in West Africa were of tribal nobility and former slave owners themselves. In 1733, they revolted and ad island-wide massacre of families occurred. Six months passed before the rebellion was quelled. The white sand beaches of the Virgin Islands have a well-deserved reputation for being among the most beautiful beaches in the world. Picture-postcard beaches fringe Hawksnest Bay, Trunk Bay, Cinnamon Bay, Saltpond Bay and many of St John’s other sheltered coves. Sand, the key ingredient to any beach, is brought to the island shore by waves, tides, and currents. Primarily the sand comes from two sources within the bay, marine algae that grow just offshore and from living coral reefs. Both, when broken down into tiny fragments, make sand. Without the algae and the reefs, the ready supply of sand would disappear, as would, in time, the beaches. The Visitor Contact Station in Cruz Bay and picnic areas at Trunk Bay and Hawksnest beaches are wheelchair accessible. Wheelchair accessibility to beaches and trails is extremely limited due to the steep topography of the island. Cinnamon Bay campground has several accessible campsites. Call the Park for more information. An island “tour” via safari bus requires two hours plus any travel time to and from St. Thomas. Frequent taxi service available to popular beach areas; allow three to five hours. Renting a vehicle for the day permits more extensive tours of island to areas which are less visited. Virgin Islands National Park covers about one-half of St. John Island and Hassel Island in St. Thomas harbor and includes quiet coves, blue green waters, and white sandy beaches fringed by lush green hills. Here, too, are early Carib Indian relics and the remains of Danish colonial sugar plantations. Camping is restricted on park land to Cinnamon Bay Campground. Accommodations include bare tent sites, sites with tent-covered platforms already set up, and cottages. Visitors must be at least 25 years old to rent a car. There are several dealers on St John. Remember to drive on the left. Seat belt laws are strictly enforced. Foreign drivers should obtain a temporary permit from the Department of Public Safety. No admission fees. Donations are accepted. There is a donation box available at the Cruz Bay Visitor Center. A same day use fee is collected at Annaberg and Trunk Bay. Children age 16 and under are admitted free; adults, $4.00; individual annual pass, $10.00; family annual pass, $15.00; Golden Age and Golden Access annual cardholders are admitted half price. Park waters are open to fishing with hand-held rods. Fishing is not allowed in Trunk Bay and in buoy-designated swimming areas. Possession of spearguns within the park is prohibited. For world class deep sea fishing, charter boats are available in Red Hook, St Thomas. There are a wide variety of restaurants and small grocery stores in the Cruz Bay area and in some of the outlying parts of the island as well. There are a variety of hiking trails, including numerous old Danish plantation roads, that beckon you to discover the Virgin Islands National Park. Lodging in the Virgin Islands National Park is restricted to park land at Cinnamon Bay Campground. Pets are not allowed on Park beaches, in the campground or in picnic areas, but may be walked, (leashed) on trails. Park Rangers, at the visitor center, are available to help plan your visit, which may include guided island hikes, historical tours, snorkeling trips, cultural crafts demonstrations, and evening campground programs. Advanced registration and transportation fees are required in some cases. Don’t let sunburn ruin your visit. Protect yourself from overexposure to the tropical sun with sunscreen lotion, hats and shirts. The sun’s rays are most intense between 10 a.m. and 2 p.m.
Beware of unfamiliar plants. Some plants, such as manchineel, are extremely poisonous. Drive on the left as required by Virgin Islands law. Drive slowly and defensively on the twisting roads and watch out for wandering donkeys and livestock around the next curve. Remember to buckle up; it could save your life! Beware of heavy surf. Large swells, mostly in fall and winter months, are the number one cause of injury in the Park. Some bay bottoms drop off steeply from the shore, resulting in large waves that break at the water’s edge. Undertows may also accompany large waves. Never swim alone. Respect all beach closure notices; they are there for your protection and the protection of Park resources. Avoid climbing on walls of ruins or removing pieces of them. Ruins are often unstable and bodily injury could result. The historic buildings, and artifacts found on the ground, are precious cultural resources that the Park is mandated to protect for future visitors. Watch your step while hiking Park trails. Many trails are steep and rocky. Enjoy the scenery, but be aware of the ground ahead. Cruz Bay Visitor Center is only a five minute walk away from the public ferry dock. The visitor center is the ideal place to start your park explorations. The center contains exhibits, a park video, brochures, maps, and books. Light cotton clothes recommended. Lightweight trousers help protect against insect bites. Casual clothes sufficient for majority of dining establishments.